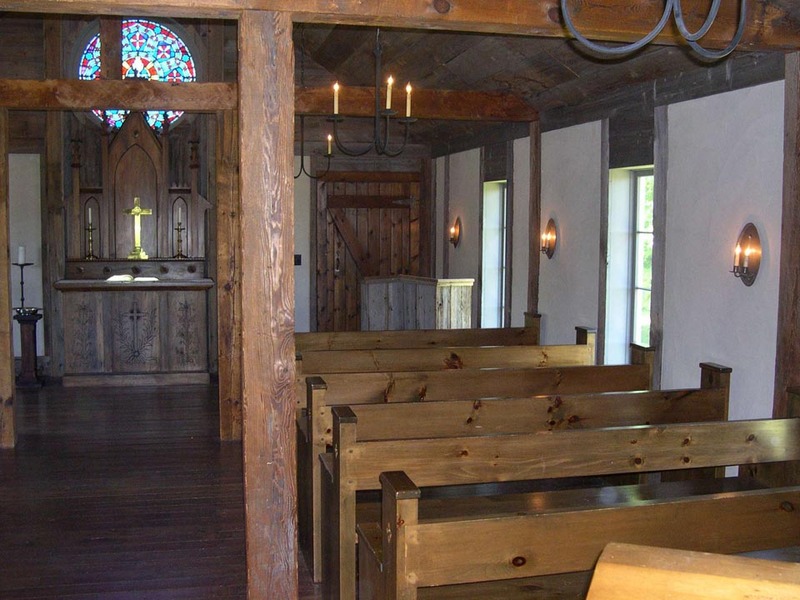 The wood for the pews was donated by Brill Manufacturing and designed and assembled by the Village Carpentry Staff. The window in the narthex is a gift from the Scottville United Methodist Church. 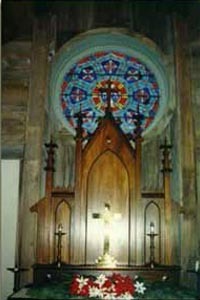 The sanctuary window, Calvary cross, and candlesticks are a gift from Grace Episcopal Church. The window is a memorial to Samuel Arnott Snow, an early Ludington pharmacist. One of the pump organs was built by the Star Organ Company around 1860. 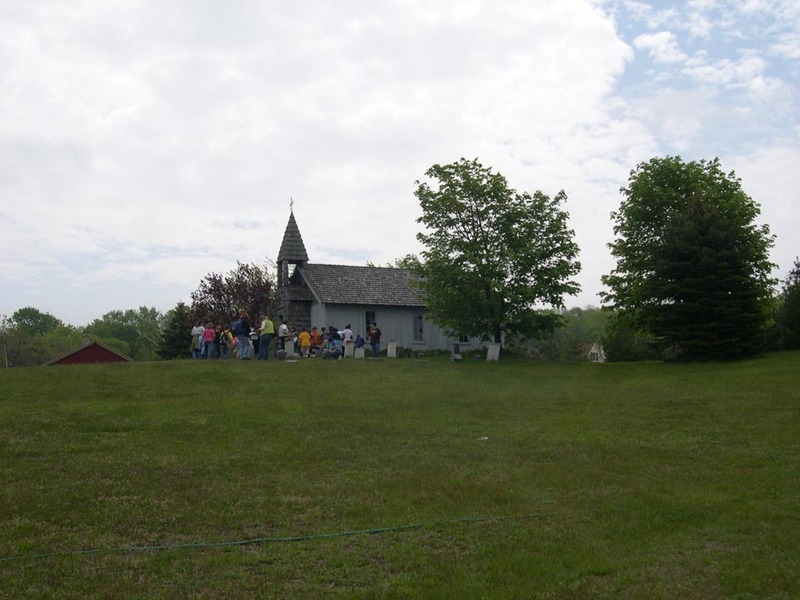 St. Paul United Methodist of Riverton Township donated the steeple when their Morton Road Church was remodeled. 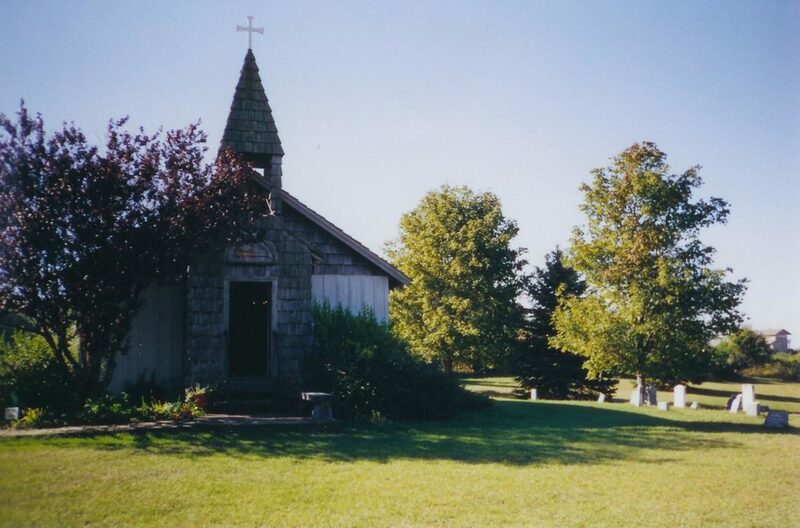 The White Pine Chapel is available to rent for private weddings, baptisms, and memorial services. Contact us for further information at (231) 843-4808 or e-mail us at michelle@mchshistory.org. 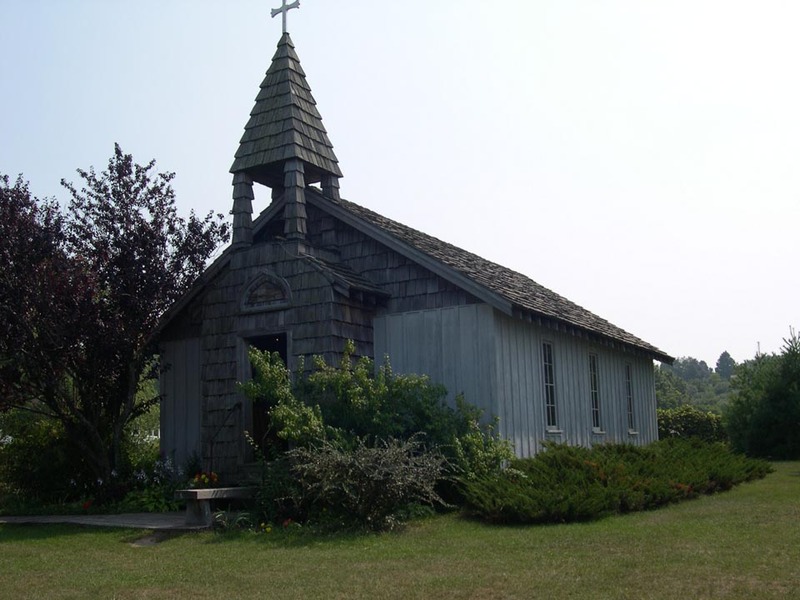 Our charming and rustic chapel is perfect for weddings, baptisms, or other religious events. Located on a hilltop, it provides a unique atmosphere and is picturesque and nostalgic. 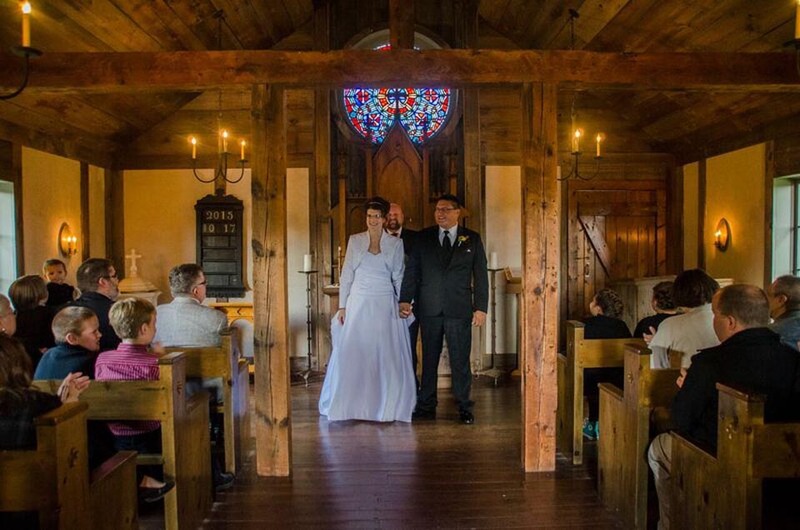 The rental fee for wedding ceremonies, receptions, and other usages is $425 for two hours plus a $150 security deposit, and $100 per hour if additional time is needed (i.e. for the bridal party to get ready on-site). If you plan to have a rehearsal, please do so within the scheduled hours of reservation. 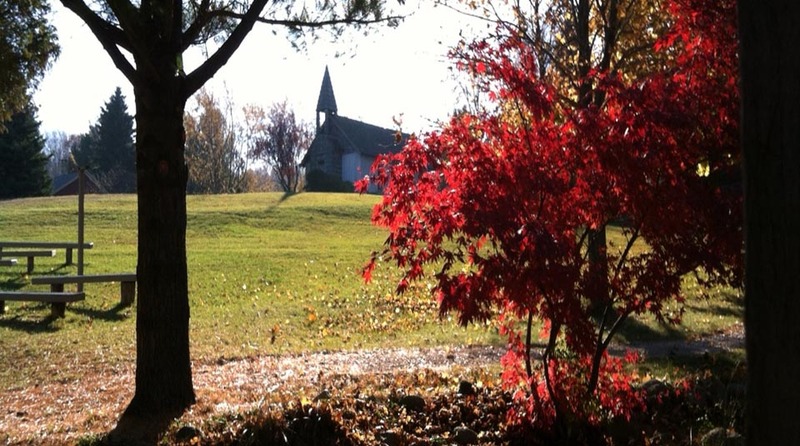 Otherwise, please reserve the chapel for the rehearsal with a separate facility usage agreement. Rehearsals scheduled prior to the wedding time, or the day before, will be an additional $100 an hour. Our grounds are a very quiet and unique place to hold your reception. Tents are allowed in certain areas of the Village, however, we do not provide tents, tables, chairs, or lighting. Our kitchen is available for use by your caterer; caterers must hold a State of Michigan ServSafe certification. Rental of the kitchen is $250.00. The rental fee for a reception only is $425 for the first two hours plus a $150 security deposit, and $100 per hour thereafter. The rental fee for a wedding and rehearsal is $800.00 plus the security deposit. Alcohol is prohibited on the grounds. 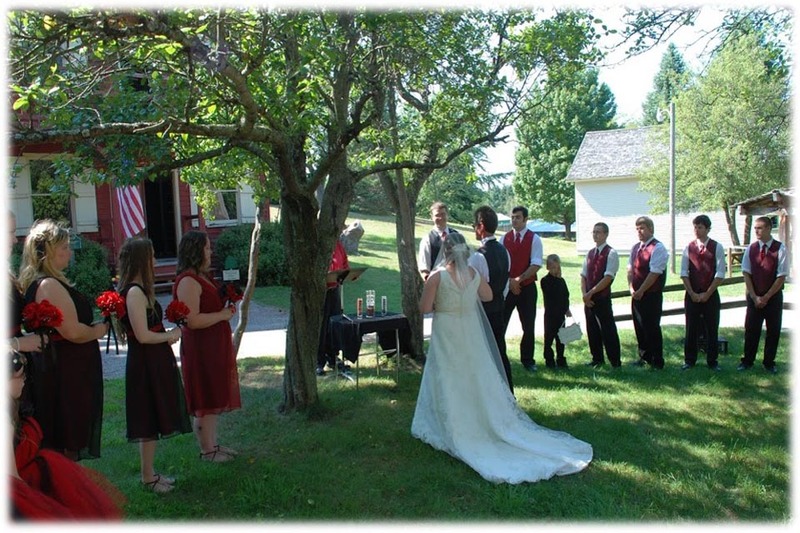 Outdoor weddings may be held throughout the Village with nearly unlimited seating. Tents, chairs, or other items are the responsibility of the bride and groom. 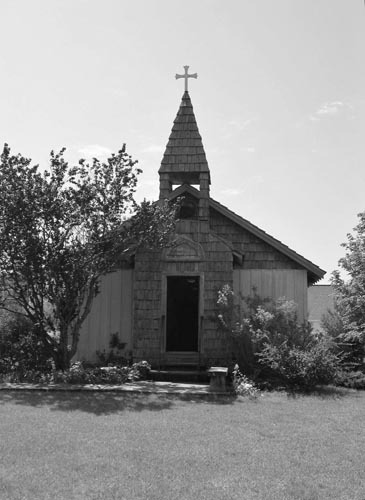 The rental fee is the same as that for a Chapel wedding.